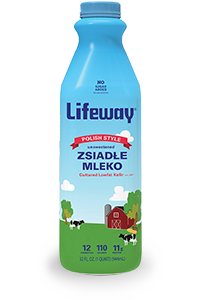 Lifeway’s Zsiadle Mleko is an unsweetened Polish style kefir made with low fat milk. Kefir, a tart and tangy cultured dairy drink with 12 probiotic cultures, has been popular in Eastern Europe for more than 2000 years. Zsiadle Mleko Kefir is gluten-free, up to 99% lactose-free, and made with all-natural, non-GMO ingredients. Rich in protein and calcium, you can enjoy this thick cultured drink anytime! Pasteurized Cultured Low Fat Milk, Nonfat Milk, Pectin, Vitamin A Palmitate, Vitamin D3.